Happy Monday! Are you ready for the week ahead? Can you believe we’re in the home stretch of the challenge? Wow! Cathy Thompson is a new slicer who wrote “Just a Smile.” It reminded me of the importance of recognizing those we know and don’t know with a smile. I hope you’ll read it and be inspired to spread some some cheer on this first day of the work week. Remember to fill out the Google Form on Dana’s post if you took on the commenting challenge over the weekend. Click here to fill out the form. Use the SAME email/username information on all of your March comments. Post ONE permalink to your slice of life story by 11:59 p.m. EDT to be in the running for a prize. 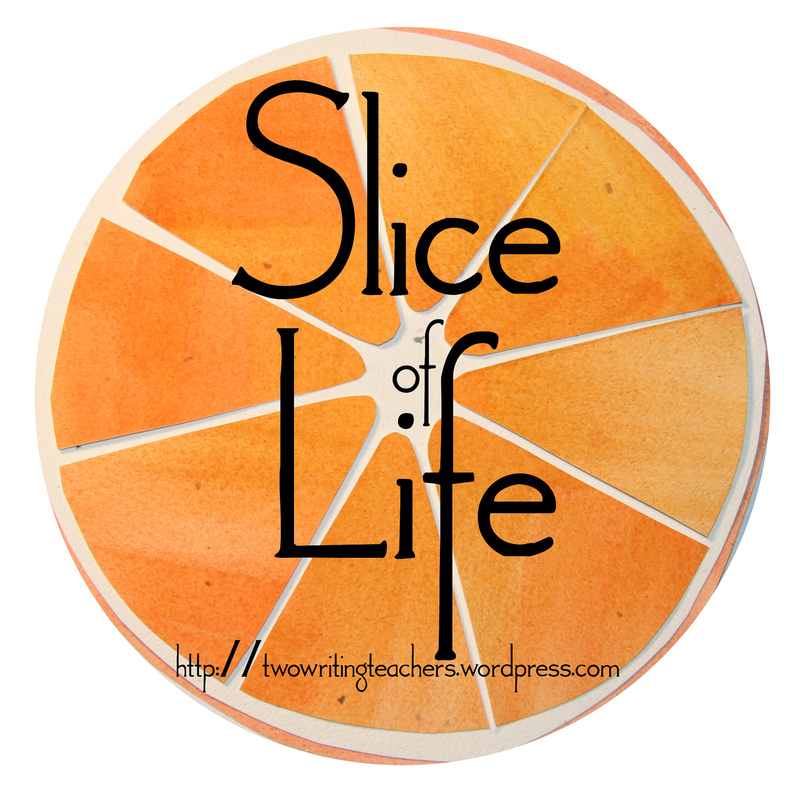 Use #sol14 for tweets about Slice of Life Story Challenge. A – M last names: LeAnn Carpenter (aka: Elsie) – leannecarpenter[at]sbcglobal[dot]net. N– Z last names: Amanda Villagomez (aka: Mrs. V.) – amandavillagomez[at]gmail[dot]com. http://wp.me/p28u6D-75 I almost forgot to write! I get later every night! I created pet sitting cliff notes after writing out directions for friends. Good thing they like dogs. Taking a break to enjoy our beautiful Spring break. ACHOO! My very first attempt at a poem as my slice for today. How did it get to be 8 pm? Kids have no concept of age. Day 24: the first hours of Spring break: being present. Today’s fun at Epcot was full of “clamshell” rides. Caught by a quote. . .
Tonight seemed like a struggle, but I got this! Shhhh! A secret Monday guilty pleasure. Tonight we took ‘chewing’ for granted…and it got a little scary. Strike that — really scary. Raising my son has been an unexpected journey, but I wouldn’t do it any other way. Ahhhh….I think I get it. making connections: feet, brain, tapping away. . . This was a piece that I just don’t feel is “finished” but is a slice. I just couldn’t take more time. Today’s post: NCAA: Sweet Sixteen http://learningisgrowing.wordpress.com/2014/03/24/ncaa-sweet-sixteen/ GO CYCLONES! I don’t know if this is slice…it’s probably more of a reflections. Thinking about writers. My son’s first deer hunt. Changing attitudes about which comes first…the baby carriage or the marriage? I was sick today, so it all worked out in the end, but I screwed up! Kathy, I went to your site and this does not appear to be posted. Did you remember to push “Submit” or “Publish”? The last post was yesterday’s. While my daughter enters a new phase in her life, I only wish her long stretches of love and happiness. I keep forgetting to post my link! Ahhhh! I finally can send that email I’ve been putting off! just some thoughts of the day. A day off with the hubs…a restoration day. I just finished Veronica Roth’s Divergent series. Which faction would you join? Some topics just need an extra day of slicing. This year’s book spine poems. How come I write them only in March? Day 24- Nothing but sand! A reflection after a weekend in NYC! Some verse on standardized testing. Have to link this quickly. He thinks I’m going to let him watch Curious George. Nope. I make lists for everything, so why not for vacation, too? I wrote this yesterday, when I had a little “extra” time. Today is back to reality, Spring Break is over. I was overwhelmed with a need to pound this out. And that is why I write, to get it out of my soul. Slowing down to savor an unexpected visitor! What’s the best use of instructional time? Considering advice from two tweets from #tcrwp Spring Saturday reunion! Playing around with point of view today. It was fun! We had a low key but happy birthday party this weekend. Mom didn’t have time to write, so I’ll take over today’s slice. A Monday Morning Menagerie of Odds and Ends, with design changes, comics, the Muppets, and writing fairy tales on Twitter. Be sure to get a CO detector!